NBC’s The Blacklist was sneaky to have doctored photos of former GOP Rep. Allen West and current Senator Ted Cruz on this week’s episode. They were implying that an international spy/criminal was involved with them. That was dirty. West’s current job seems to be slamming everything Obama to the delight of the far Right. Goldie in the Mack told his brother (Walter Mosley/T.C. from Magnum P.I.) that no one was closing him out of his business and the far Right seem to feel the same way about their grind. There shouldn’t been a blacklist when anyone is trying to solve the problems facing this state and this nation. 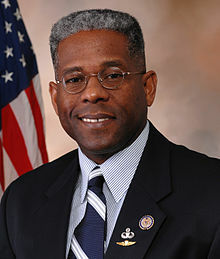 Allen West needs to be at the table and sitting between Rev. Jeremiah Wright and Rev. Al Sharpton. I have always believed that Team Obama sent a “stay away for now” message to Sharpton, Minster Farrakhan and Rev. Jesse Jackson. Well it’s time for everyone to come together because it seems like open season on our youth. A smart sista tried to tell me last week (in her West Indian accent) that we shouldn’t teach our youth to adjust to those with a Stand Your Ground mentality. Well, I have been a Black male for fifty years and being right on the side of a 7-11 store sometimes means that wrong people will end you. President Obama launches an effort today called “My Brother’s Keeper” aimed at helping young men get the skills to attend college and get good jobs. Who can be against that? I hope GOP primary voters in Georgia’s second congressional district will select Vivian Childs as their nominee because she and Rep. Sanford Bishop would have a healthy and helpful six months dialog about building bridges. I am sure we would learned that most southern Blacks really want the same things. It’s going to be the summer and fall of Changing Mindsets and everyone should be there. Helen Blocker Adams, mayoral candidate in Augusta, always promotes having everyone together; get to know every street, corner, country club, church and teen center. Helen is wants right about our lovely state.